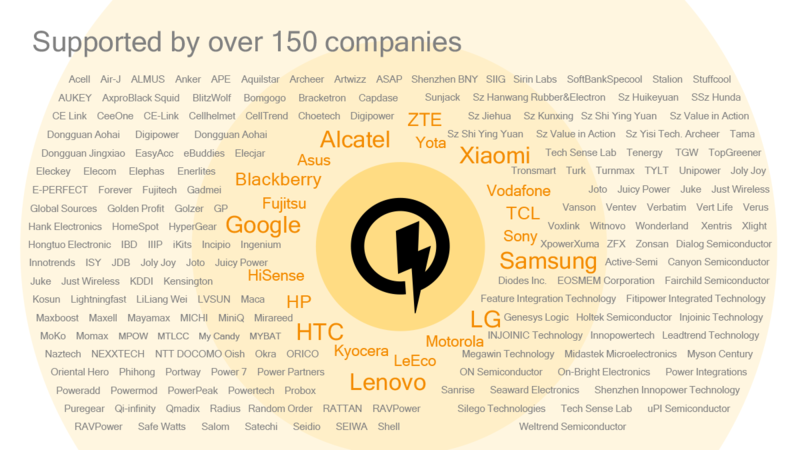 At an event in New York, Qualcomm has taken the wraps off of its latest advancement in charging technology: Quick Charge 4.0. Building upon the success of preceding Quick Charge technologies, Quick Charge 4.0 promises to deliver even faster charge times and greater efficiency levels, so that mobile consumers spend less time hugging the wall. Qualcomm found that three of the top four concerns for people when looking for a new smartphone were related to either battery capacity or battery charging speed, and they are aiming to utilize Quick Charge 4.0 to continue improving their strong market position, with over 150 companies supporting Quick Charge, by helping assuage those fears. 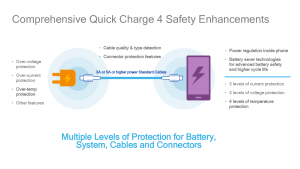 Quick Charge 4.0 claims to extend smartphone use for flagship smartphones with the Qualcomm Snapdragon 835 chip by 5 hours with only 5 minutes of charging, going “5 for 5” according to Qualcomm. 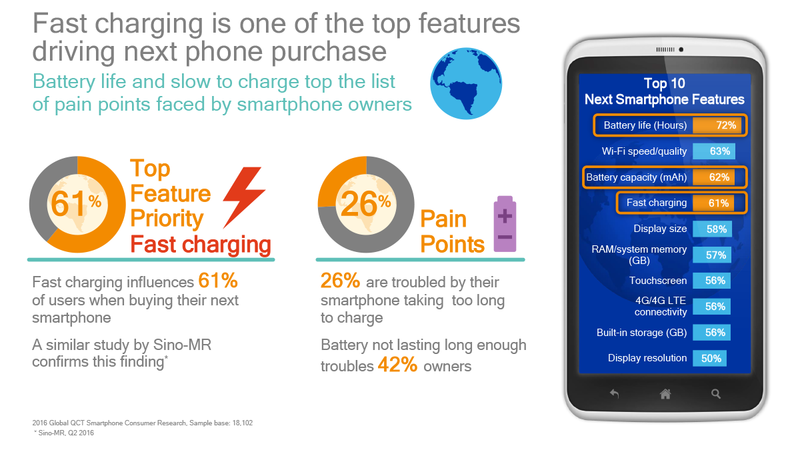 With just 15 minutes of charging time, Qualcomm claims it could quick charge a phone up to 50% battery. 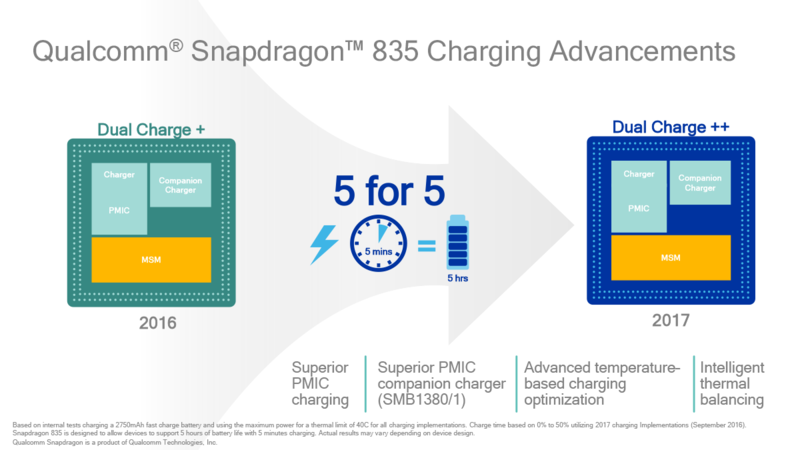 Qualcomm is once again improving their Dual Charge parallel charging technology (now called “Dual Charge++”) to provide up to 20% faster charging and 30% higher efficiency at up to 5 degrees celsius cooler temperatures compared to Quick Charge 3.0, which itself featured improvements over the predecessor technologies. 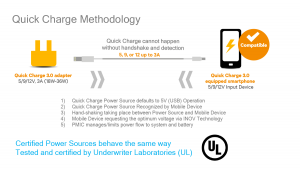 Quick Charge 4.0 also features the third release of Qualcomm’s INOV (Intelligent Negotiation for Optimum Voltage) power management algorithm. This release of INOV includes real-time thermal management, which Qualcomm says is a technology industry first. INOV 3.0 focuses on optimization by determining and selecting optimal power transfer level for the thermal conditions present. 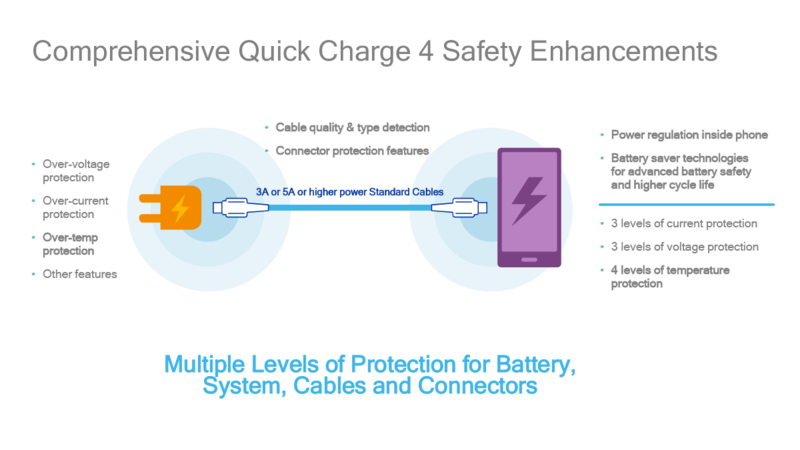 A major point of focus for Quick Charge 4.0 has been on improving the safety and protection features, with multiple additional layers of protection added to help prevent battery over-charging. 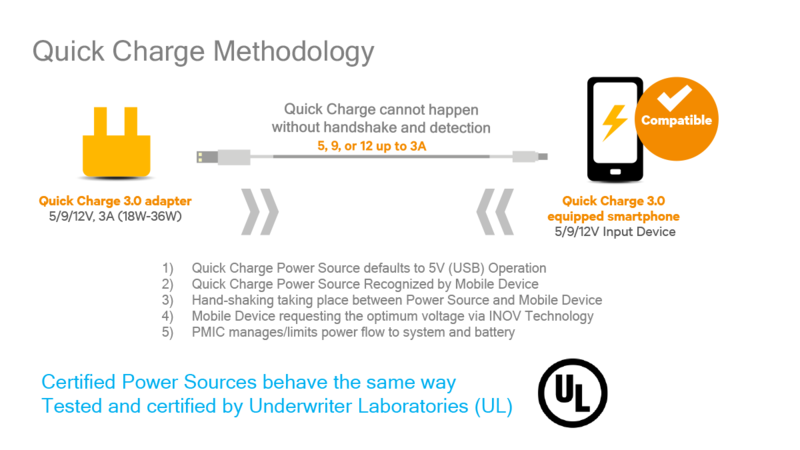 Quick Charge 4.0 keeps many of the existing features such as the 3 layers of over-voltage protection, 3 layers of over-current protection, and 4 layers of over-temp protection, and supplements them with new features such as the ability to detect the quality and condition of the cable being used. 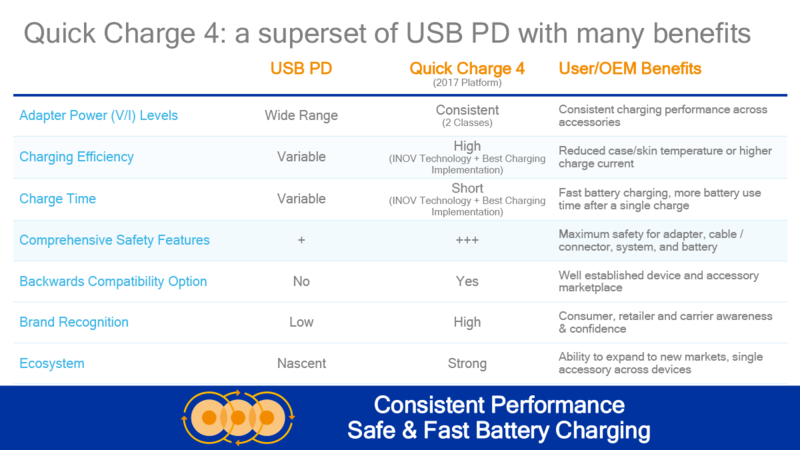 One of the most important changes though is the addition of compatibility with USB Power Delivery (USB PD), which could not have come at a better time, following closely on the heels of Google “strongly recommend[ing]” that devices only support charging methods that are compatible with USB PD in the new Android 7.0 Compatibility Document (with a little hint that Google “might REQUIRE all type-C devices to support full interoperability with standard type-C chargers” in the future). For the best QC 4.0 performance, Qualcomm is also introducing two new power management ICs, the SMB1380 and SMB1381. These PMIC are engineered for low impedance, with up to 95% peak efficiency, and support for advanced features like battery differential sensing. The SMB3180/1 will be made available by the end of 2016. 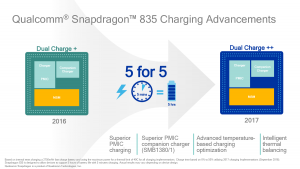 Qualcomm’s Quick Charge 4.0 fast charging technology will be available in the next generation of Qualcomm Snapdragon processors, starting with the Qualcomm Snapdragon 835. The Snapdragon 835 is expected to ship in commercial devices beginning in the first half of 2017. 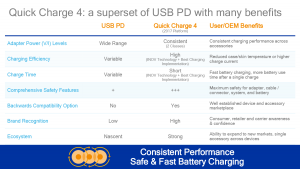 What are your thoughts on Qualcomm’s Quick Charge 4.0? Let us know in the comments below!